Preheat oven to 350◦F. Line a baking sheet with aluminum foil; set aside. In a large bowl, toss the Pretzels, cereal and nuts together; set aside. 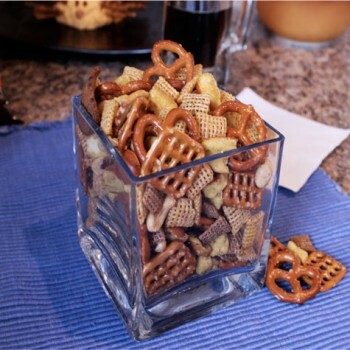 In a microwave-able cup, melt butter or margarine, Worcestershire Sauce and seasonings; stir and pour over Pretzel mixture. Gently toss with melted butter mixture and spread out on prepared baking sheet. Bake for 10 minutes and serve. Tip: Be creative – we toasted up some leftover bread rounds and added them. For a sweet & salty flavor, try adding some mini marshmallows after the mix comes out of the oven.